When I was thirteen I was in the same school class as Ivar Vics. We were both not the most popular guy in our class, so we sticked together for a while. Not long, because Ivar left shool after the second class. He changed his name in Dr. Rat, became a hero in the Dutch punk and graffiti scene and died at the age of 21. I never was a punk. I didn’t understand the concept untill the early nineties, and by then I had already given away almost all the records, tapes and fanzines from that period. 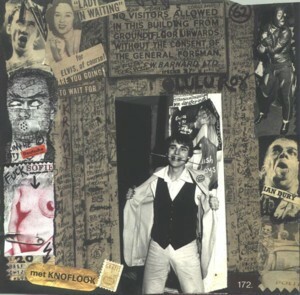 I loved the punk fanzines! Ivar loved fanzines too. He made several issues of the Koekrant and other stencilled magazines. Nowadays he is a legend and his art is considered to be far better than I remember it. But he was one of the first in Holland who took graffiti serious. And he was all over the place: you cannot mention punk or graffiti without mentioning Dr Rat. There is an underground playground in Amsterdam that I visit every now and then with my children. This was one of the places where Ivar sprayed a lot of paint, but there is no longer anything of his graffiti to been seen in Amsterdam. Still, every time I enter this underground place, I look for a sign of Ivar. Diana Ozon, who was a close friend of him, has gathered some info on him on her site. The picture of Ivar and the DDT clubcard, that he designed, come from Diana’s site. Today I listened to a cassette called Tubilex swingt . On this tape is the famous menstruation dub poem by Jah Tampon (Diana Ozon) and Amarillo. This recording was broadcasted on the ledgendary Amsterdam pirate radio station Radio Dead, I guess in the early eighties. It was also aired on a national radio station and caused quite some commation. The tape that I have, was probably part of a special edition of the Koekrant, but I cannot remember it. I hoped to hear the voice of Ivar on the tape, but even if it is, i doubt if i could recognise it. Listening to this tape brings back more memories of those days than I thought I had. But it does not bring back the tapes, records and fanzines! 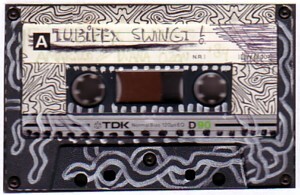 MP3’s of the Tubilex Swingt cassette can be found here. Hij is ook te vinden op de kroonjuwelen dvd. In beeld en geluid geloof ik! Ik ben Broodje en een oude punker. Ik heb Ivar gekent als punker en graffitte kunstenaar. Ik zal best eens met je willen mailen/praten. Wauw, moest opeens aan Ivar denken en na google kwam ik hier uit! Ik ben Hans, samen met Saraya en haar zoontje Sven hebben wij het Noname cafe/concerten opgezet…. Weten jullie nog??? “Sven speelt RAFje in plaats van cowboytje” is een Nieuwe Revu-bijschrift dat ik me altijd ben blijven herinneren. Hoe is het nu met Sven? Hoi Hans, Zou graag met je in contact komen! Ik werk vanuit de oude Aorta, en ben de geschiedenis van de plek aan het uitpluizen!